Many clinical trial sponsors are so focused on initial submission and updates of their studies on government registries in an accurate and timely manner that, once a study is completed, they often neglect to post the final results. This is particularly problematic with European registries, which are complicated, confusing, and inconsistent in format. The numbers don’t lie. Looking at public data on EU CTR as of July 16, a TrialScope analysis found a total of the over 16,000 studies that ended more than 12 months earlier, only around 10,000 had results posted. So what exactly is required for EU CTR submission? 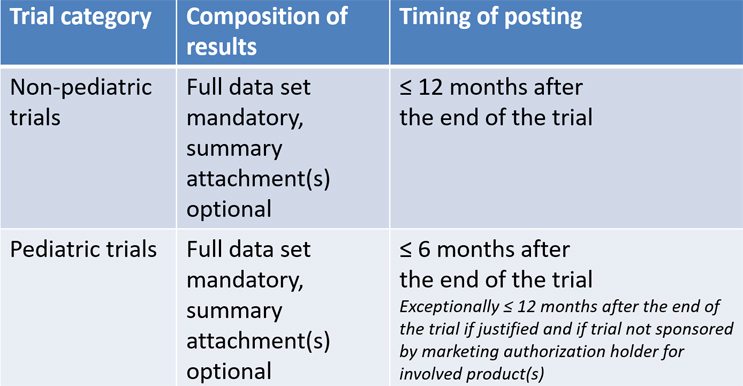 The following table is an abbreviation of the requirements for trials that ended on or after July 24, 2014. Details and requirements for older studies are available at eudract.ema.europa.eu. Failure to report clinical trials results is not limited to EudraCT and other regional sites. In an articlepublished early this year, STAT examined nearly 18,700 clinical trials whose results — based on publicly available data — should have been posted to the U.S.-based ClinicalTrials.gov between 2008 and Sept. 11, 2017. Overall, trial sponsors had disclosed 72 percent of required results to the federal ClinicalTrials.gov database as of September 2017. That compares with 58 percent just two years earlier. However, results for four in every 10 trials were reported after the legal deadline — one year following a trial’s completion or termination. Noncompliant sponsors have several courses of action they can take regarding submission of clinical trial results. They can choose to do nothing, and keep their collective fingers crossed that their noncompliance will slip under the radar. Or, they can take a more proactive (in most cases, retro­-active) approach, starting by listing all EU studies. Then they must assess disclosure deadlines. Next, they can collect available trial information and prioritize based on past due and upcoming deadlines. All of this should be predicated, of course, on organizational SOPs and guidelines on disclosure and transparency. Implementation of technology to streamline the entire process can eliminate the headaches inherent to clinical trial results submission. For a more detailed look at the issue and how to improve EU results disclosure, access a free recording of our webinar from Sept. 12. As TrialScope’s chief strategy officer, Thomas Wicks ensures that the company — and its customer-partners — are kept current with clinical trials disclosure regulations. With more than 17 years of experience, he is considered an expert in disclosure and transparency. He provides guidance on policies and procedures in the area of clinical trials submissions management.